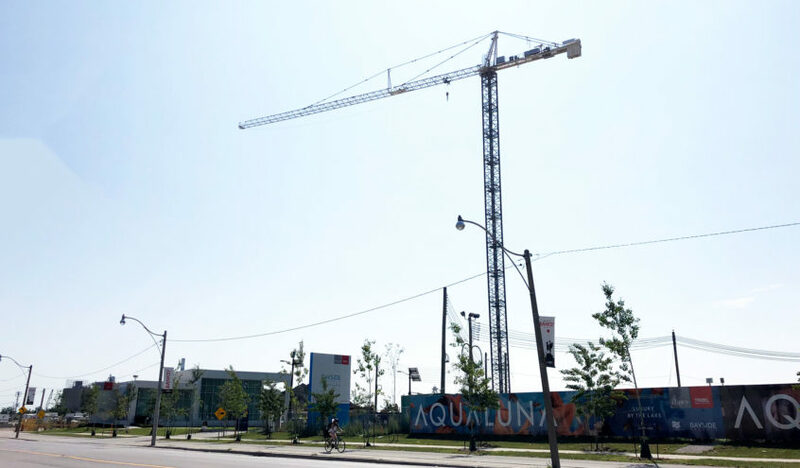 With the shoring and excavation of the Aquabella community nearing completion, the construction crane was installed last week. It marks a construction milestone for Aquabella at Bayside. Construction cranes are installed one piece at a time, like a jumbo “mechano” or lego set. First, the concrete pad is poured. The pad typically consists of approximately 5 to 8 feet thick of concrete. This concrete pad is the base on which the crane is installed. Next, sections of the crane are brought on-site, piece by piece. 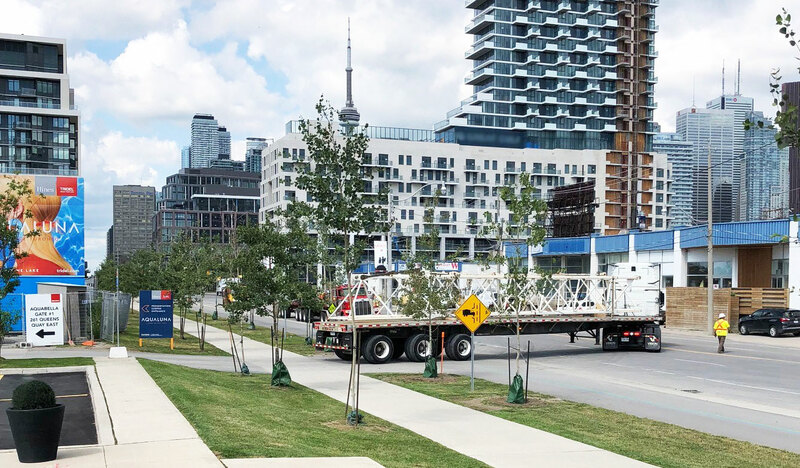 Each crane section is about the length of a flatbed truck – for obvious transportation reasons. As each portion arrives, it is lifted off the flatbed truck and hoisted skywards by a mobile crane. The first section of crane is installed directly onto the concrete crane pad. The tower is then assembled on top of it, piece by piece, moving upwards, until it reaches it’s full height. Once the tower section is complete, the turntable is installed. The turntable – which allows the crane to swivel back and forth – is installed centered to the tower and is where the operators driver’s cab is located. Next, counterweights are installed. These counterweights will allow the crane to safely lift and move the heavy materials used in the construction of Aquabella. Lastly, the boom is installed. The boom is the arm that stretches out from the tower and does heavy lifting. 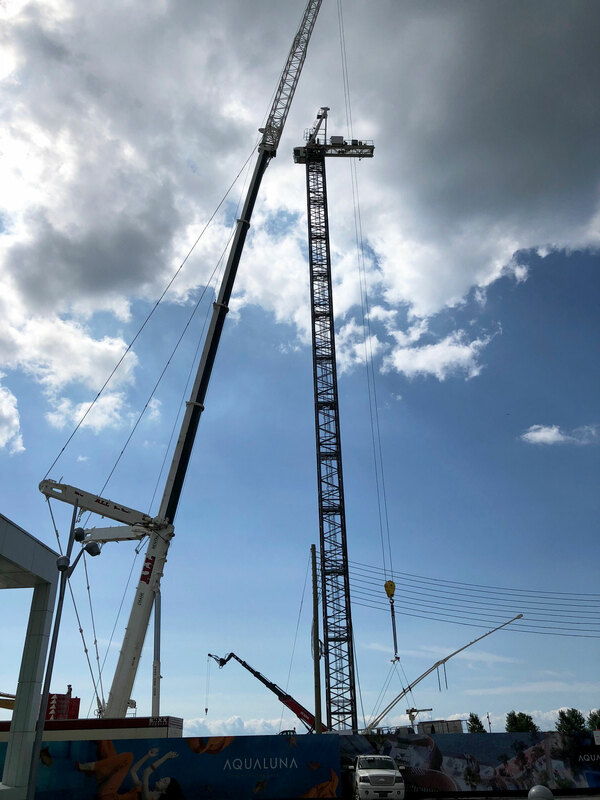 Installation of the construction crane means that the on-site construction team can now move into the next stages, including construction of the elevator pads and forming the foundation of the community. Aquabella is the third phase of the successful Hines and Tridel Bayside community, located on the Toronto Waterfront at Queens Quay and Sherbourne. Offering stunning views of the city skyline and Lake Ontario, Aquabella will feature 174 suites once complete. Learn more about Aquabella at Bayside. Learn more about the Bayside community.